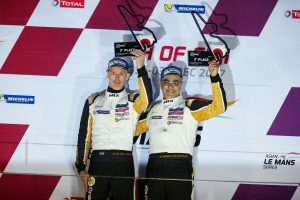 Algarve Pro Racing Team’s gentleman driver pairing, Dean Koutsoumidis and Ate Dirk de Jong, brilliantly overcame exceptionally cold and slippery conditions to take the Gentleman’s Trophy win in the 2017-18 Asian Le Mans Series 4 Hours of Fuji (1-3 December). Tyre warm-up was a major issue for the entire AsianLMS field, as ambient temperatures at the base of Mount Fuji hovered around freezing, some 20 degrees below what teams experienced one month earlier in Zhuhai, for the duration of the weekend. It took a great deal of patience, composure and technique to bring the Michelin rubber into the optimal temperature range, but grip was at a premium for even the most seasoned of Pro drivers. Ambient temperatures peaked at eight degrees Celsius as the 4 Hours of Fuji got underway on Sunday (3 December) afternoon, and Koutsoumidis ensured he made headway through the slower GT pack by driving cleanly and consistently during a slippery double stint that took him to around mid-distance. De Jong took the reins of the #25 Ligier JSP2 after approximately 1h50m of racing and was quick to dip below the 1m40s barrier and break into the top ten overall. The latter half of the race was punctuated by three further pit stops; the first was extended when Algarve Pro Racing was given a ten-second penalty for a pit lane infringement, but the delay ultimately had no bearing on the result. Thereafter, De Jong kept pace before returning the black and gold #25 machine back to Koutsoumidis, who was once again remarkably consistent while others faltered, to achieve a hard-fought Gentleman’s Trophy win and a top eight result at the flag.